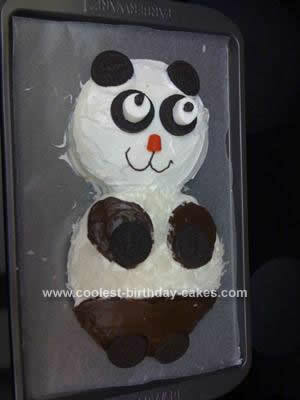 I made this Panda Cake Design for my friend Amanda’s Birthday. Her nickname is Panda so I made her a Panda Cake. I used a box of cake mix (in this case Confetti because its her favorite) and made two 9″ round cakes. After baking and cooling, I cut one of the cakes to be a smaller circle and used this one as the “head” portion. I frosted the whole thing with white vanilla frosting and used chocolate frosting for the arms and the bottom half. I used Oreo’s for the ears, eyes, and paws. I used a marshmallow (cut in half, one half for each eye) on top of the Oreo eyes. I used a red Dot for the nose and two raisins for the “eye balls”. I used coconut on the belly part to appear as fur. I used a ziplock bag filled with chocolate frosting with a tiny cut in the corner to form the mouth. This was super easy and turned out so much better than expected!